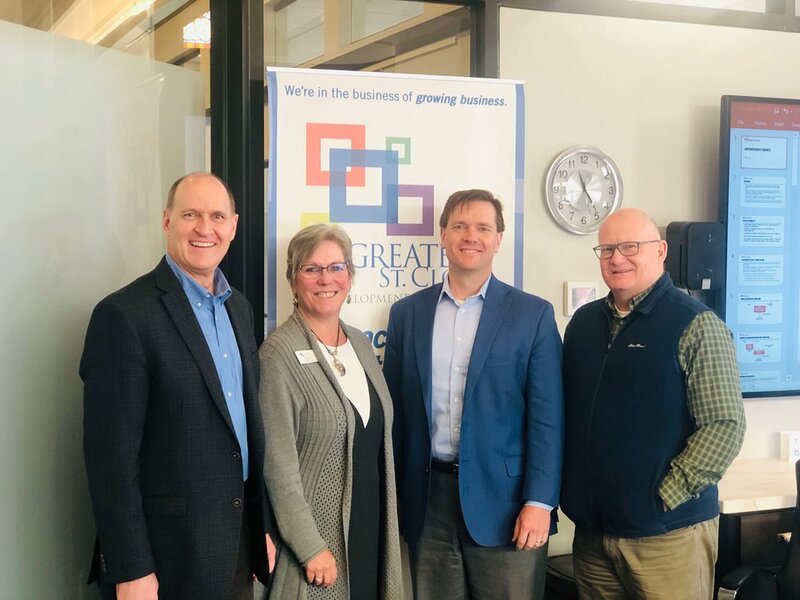 (Pictured left to right: Steve Schueller, (Schlenner Wenner & Co.), Patti Gartland, (GSDC), Norm Jones (Winthrop & Weinstine) and Greg Hohlen (Minnwest Bank). On March 27th, GSDC hosted 20 local investors to participate in a round table discussion led by Norm Jones, Shareholder/Attorney at Winthrop & Weinstine. Norm’s vast experiencing connecting developers, investors and lenders in forming partnerships provided thoughtful insight and discussion on how local developers and investors can structure projects in Opportunity Zones. St. Cloud is home to three designated Opportunity Zones including East St. Cloud, Downtown St. Cloud, and South St. Cloud. We thank GSDC investors and Business Team members for Greg Hohlen (Minnwest Bank) and Steve Schueller (Schlenner Wenner & Co.) for their leadership on advancing the Opportunity Zones conversation. Posted on April 19, 2019 by GSDC User. Our region is hitting the reset button with respect to the culture it has created in supporting innovation. Through the leadership underway across our region’s leading universities, high schools and entrepreneurially oriented non-profits (i.e. MN Cup, Beta.mn, and Minne*) additional resources and mentorship are being directed at young entrepreneurs who represent the future of job growth and prosperity in the state and region we love. Our private sector is coming together too through the Greater St. Cloud Development Corporation’s leadership and our new early stage venture fund Great North Labs, and our State government is pushing forward with new initiatives to improve the culture for innovation in our region. Let’s look at the history and current efforts underway at St. Cloud State University. Former St. Cloud State students have gone on to found some of our region’s most successful startups. Before Travis Kalanick founded Uber, Mynul Khan founded Field Nation while studying computer science at St. Cloud State. Field Nation could be described as the Uber for field technicians. The company Mynul founded now employs over 200 employees and has a platform which processes thousands and thousands of field IT worker orders per year. And then there is the story of Peter Taunton, another fellow Husky. Peter recognized the need for no frill gyms which could be run with significantly lower membership dues than larger gyms and founded Snap Fitness. Snap Fitness now has 2,000+ global locations in over 18 countries and is one of the very largest fitness companies in the world. At the core of these two massive entrepreneurial successes were extremely driven, tenacious founders whose ambitions carried them far. It is with this context that it was my pleasure to stop back to St. Cloud State to see what ideas are being incubated by current St. Cloud State students through the annual Husky Pitch event led St. Cloud State’s Entrepreneurship Club. Although each of the final seven final startup teams which presented at the Husky Pitch showed plenty of ambition and vision, the two startup teams which stood out the most to me were OUT Café and Remedy Club. Since moving to greater St. Cloud area in 2013, co-founder Catherine Larson found it challenging to find a place that felt safe for the LGBTQ+ community and also fostered a culture of acceptance. And it isn’t just a problem in St. Cloud. LGBT youth who typically come from highly rejecting families are 8.4 times more likely to have a suicide attempt. Youth have little to no public LGBT space that allow them to participate. And it isn’t just a problem for youth… Up to 25% of the general LGBT community has a moderate alcohol dependency, compared to 5-10% of the general population. One of the drivers of this higher alcohol dependency among the LGBT community can be attributed to bars as being the lone public space where they feel safe and accepted. The idea behind OUT Café is to create an LGBTQ+ safe space and sell a culture of acceptance. Plans are underway to develop the first OUT Café retail location in downtown St. Cloud. Congratulations to each of the seven finalists in the 2019 Husky Pitch! Thanks to Entrepreneurship Club President Caitlyn Casper for leading the charge to keep the Husky Pitch going, continuing the tradition of entrepreneurially ambition from St. Cloud State students. Greater St. Cloud Development Corporation, which leads economic development for the Greater St. Cloud community, is focusing resources on and collaborating with partners in creating and supporting a robust ecosystem for start-ups. This includes contributing and raising funds towards this effort and convening individuals who are champions of business start-ups. GSDC President Patti Gartland was on hand for this year’s Husky Pitch, her first pitch event. GSDC will have a major new program to announce in the coming weeks to support a robust ecosystem for startups in Greater Minnesota. Stay tuned! Beyond the initiatives being taken at the university level, our state government is also prioritizing efforts to create a more robust innovation ecosystem. When it comes to politics, I try to take a non-partisan view and instead focus on the policies and budgets created by lawmakers. With that said, I see as one of the biggest bi-partisan problems in politics is that the many of our government officials lack an understanding of current technology opportunities, issues and trends as noted in the recent federal government hearings with big tech players. This is why the appointment of someone like Steve Grove to his post as Commission of MN DEED is so refreshing and his work bringing forward the new Minnesota Innovation Collaborative. Minnesota ranks very low in terms of the availability of capital to founders seeking to raise angel investment dollars. The Minnesota Innovation Collaborative (MIC) seeks to reinstate Minnesota’s previous tax credit program (https://greatnorthlabs.com/minnesota-innovation-collaborative/) and also provide additional funding support for entrepreneurial education programs. The MIC’s angel tax credit program and new entrepreneurially focused education programs will have a direct impact on the success of our future breakout founders starting high growth companies like Out Café and Remedy Club. I believe constituents of our state should support these efforts as our state’s culture must be more supportive of entrepreneurs if it is to continue to prosper for our future generations. This past Wednesday, I was invited to Baxter, Minnesota to join a roundtable discussion of leading Central Minnesota entrepreneurs (Janelle Riley, President Syvantis, Tom Haglin, President Lindar Corp, Scott Juranek, CEO Growth Zone) and local economic development leaders to discuss advancing innovation with Governor Tim Walz, Commissioner Steve Grove, and Speaker Melissa Hortman. My favorite quote of the day came from CEO Scott Juranek of Nisswa, Minnesota based Growth Zone. “Culture eats strategy for breakfast.” on the role leaders have in transforming their communities to foster innovation. Creating a robust ecosystem to provide capital and mentorship to our region’s future breakout entrepreneurs is key to long term prosperity in our region. I am beyond excited to see this cultural shift happening across public and private leaders to ensure we have a prosperous future for generations to come. A Change in Diet: No More Humble Pie! I’m living proof that the greater St. Cloud region is a wonderful place to live, work, engage and prosper together. I’ve lived in this community my entire life. The first 18 years were by choice of my parents. But, the following multiple decades have been by my own choice – albeit with the benefit of support from my family. It’s been the perfect place for my husband and me to grow our family, careers and social networks. And our children are now doing the same which means we are blessed to be a regular part of our children and grandchildren’s everyday lives. Although the vast majority of folks I associate with generally share my exuberance for the greater St. Cloud community, the fact remains that our humble nature in this region runs deep and wide. We tend to shun flattery and mute our horns for fear of being characterized as boastful or bragging. And for some, they’re just unaware of just how awesome our community really is. A few others remain fixated on the other side of the fence where they presume the grass grows greener. With a shrinking labor pool, we need for people to want to live, work and engage in our community. We need them to choose our community over others. As we strive to attract and retain the talent needed to support a vibrant community and economy, we need to do a better job of showcasing our region as an incredible place to visit or call home. With this we are faced with a choice: We can let others drive the narrative of our community or we can take responsibility for shaping it ourselves. The latter is exactly what we have set out to do with the launch of a comprehensive place-making digital/social media marketing campaign on January 1. We have contracted with Katie Virnig to create and deliver the Greater St. Cloud campaign on Facebook and Instagram. Katie’s capturing and sharing content about our region that is distinctive and authentic, showcasing the very best of who we are as a community. We’re delighted to find that in the few weeks since its launch, we’ve seen nearly a five-fold increase in organic engagement via Facebook, increasing from 708,384 monthly organic impressions to more than 3 million in just one month! That’s a significant increase in folks connecting and interacting with our regional brand. And we’ve only just begun! We know that the more people who engage with our content, the more our positive messaging gets seen and shared. And, while we love working with Katie, we know we can’t expect her to bear the entire burden of shaping our community narrative. In order for all of us to realize the benefits of this effort we each must commit to investing in it. At the very least we need you, personally, and your company’s social media to follow, like and share Greater St. Cloud on Face Book and Instagram. The best part? In addition to promoting our community, you’re going to love the content! Let’s all say good-bye to humble pie and hello to #greaterstcloud #stcloudshines #centralmn! Posted on February 28, 2019 by GSDC User. Unlike most areas in Minnesota and the country, our regional community is fortunate to be experiencing population growth as a result of new-to-country immigrants and refugees. While these new neighbors are eager to join the workforce, they often face unique barriers to finding employment, such as language, transportation, housing and job skills. In 2015 GSDC was instrumental in creating the Immigrant Employment Connection Group (IECG). Its purpose is to assist employers in overcoming barriers, real and perceived, in hiring this population. It also works with the prospective employees in removing impediments to their employment. In 2018 the IECG hosted an employer education event showcasing best practices developed and used by regional employers. This was a panel of employers moderated by Gail Cruikshank, GSDC Talent Director. The organization also coordinated a New to Country Career Fair showcasing more than 25 employers and attended by more than 70 job seekers. While GSDC remains involved in this initiative, the group is now being led by Tammy Biery at Career Solutions. For more information about this work contact Gail Cruikshank at gcruikshank@greaterstcloud.com or Tammy Biery at tammy.biery@CSJobs.org . Posted on February 27, 2019 by Jobspot Social. The high quality of life in our Greater St. Cloud region is a compelling asset in attracting talent from outside the area to the myriad career opportunities found here. To that end we developed and launched GreaterStCloud.com to be the one-stop resource for information about our region – for residents, students, businesses and prospective talent. The website is a wide-ranging source of information, videos, photos and blog posts about the Central Minnesota communities that make up Greater St. Cloud. Included is information about quality of life, education, health and wellness, entertainment and more. A tandem initiative is our social media marketing campaign featuring local people and communities – another way to attract talent, families and businesses. Follow us on Face Book and Instagram to discover the many delights we have to offer: Greater St. Cloud. And, keep an eye out for #StCloudShines! How can GreaterStCloud.com assist your organization? Provide a link on your web site so site visitors have an easy way to learn more about our communities. Share the link with talent candidates who are considering relocating for a position in your company. Mention the web site in blogs and other company communications. And – use the web site for your own purposes, whether to find live music for Saturday night, the best swimming hole in Central Minnesota or medical resources for a loved one. The MN Job Training Incentive Program (JTIP) provide grants of up to $200,000 to provide training for new jobs located in Greater Minnesota. Funds can be used for training costs including wages for on-the-job training, curriculum development, equipment, facilities, travel, lodging etc. Businesses are provided a grant of $2 for every $1 spent on training related expenses. To be eligible a business must add at least three new jobs and pay at least the median wage for the county, $16.26 for Benton County, $17.58 for Stearns County and $17.93 for Sherburne County. Recently DAYTA marketing received $42,000 which will be used later this summer for hiring and training new employees. PIPELINE exists to support employers in creating or enhancing a competency based dual-training approach where workers receive a combination of related instruction strategically paired with on-the-job training. Recently DeZURIK received a PIPELINE grant of $96,000 to provide tuition support for their machinists at the St. Cloud Technical and Community College for the 2018 school year. DeZURIK intends to apply for another grant for the 2019 school year. The Minnesota Job Skills Partnership Program (MJSP) provides grants of up to $400,000 to provide training for both existing and new employees to businesses who partner with accredited Minnesota educational institutions. Grants are awarded to the educational institution to develop and deliver custom training specific to business needs. A cash or in-kind contribution from the participating business must match the grant funds on at least a one-to-one basis. Recently Park Industries was awarded $350,000 to partner with St. Cloud State University and St. Cloud Technical and Community College to deliver customized training for all current and new employees. The customized training will allow the company to keep pace with its business expansion and maintain its lead in the industry. New Flyer was also awarded $350,000 for customized training which will focus on improving processes, procedures, communications and skills. All employees – including 347 of them new – will receive training in Basic Principles of Business Operations; Introduction to Hoshin Kanri (a lean manufacturing approach); Hoshin Kanri Time Management Level 1; and General Electrical Safety. Select employees will receive additional training in High-Voltage Safety and Hoshin Kanri. If you think your business might benefit from any of these three training incentive program, please contact Gail Cruikshank, Leslie Dingmann or Larry Hosch at GSDC. We are happy to help explore what might work best for your needs and to work with you to make sure the process for application is as easy as possible. GSDC was selected by Business in Focus magazine for a February, 2019 feature article highlighting the collaborative workforce efforts taking place in our region. We thank Joan Schatz, Co-President at Park Industries and GSDC board member, Tammy Biery, Executive Director Career Solutions for sharing the many innovative and collaborative workforce activities happening in our region. Read the article here. Jugaad Leadership Graduates with Exceptional Talent! GSDC Talent Director Gail Cruikshank is working with Jugaad Leadership to prepare Jugaad program graduates for employment and engagement in our community. This will include interview preparations and expanding network connections. If you are interested in connecting with these talented graduates, contact Gail Cruikshank, gcruikshank@greaterstcloud.com .